Using the components from games you already have to create a new game is a fun way to spend a day out of school! It’s school vacation week for us this whole week ahead. Monday, President’s Day, is a day off for many kids around the country, even if they don’t have the whole week off. For many parents, a whole week out of school during the winter months can seem daunting. What to do? Where to go? As a mom, I often find that the most fun and memorable moments come from an unplanned event or from the kids’ own minds when left to their own devices. And I don’t mean electronic devices. Often we’ll allow some electronics time and then all devices go off and it’s time to find something to do, whether they need to read a book, occupy themselves in their rooms, or play a board game. Over our last school vacation week, my younger two girls decided to play dominoes after my youngest had played them at school during indoor recess time on a rainy or snowy day. She was thrilled to find out that we had dominoes here as well, and what began as making “domino effect” structures and watching one domino lead to their demise, ended up being an hours-long project, using all of the dominoes plus all of the previously-popular “Squinkies” to create two entirely new games. 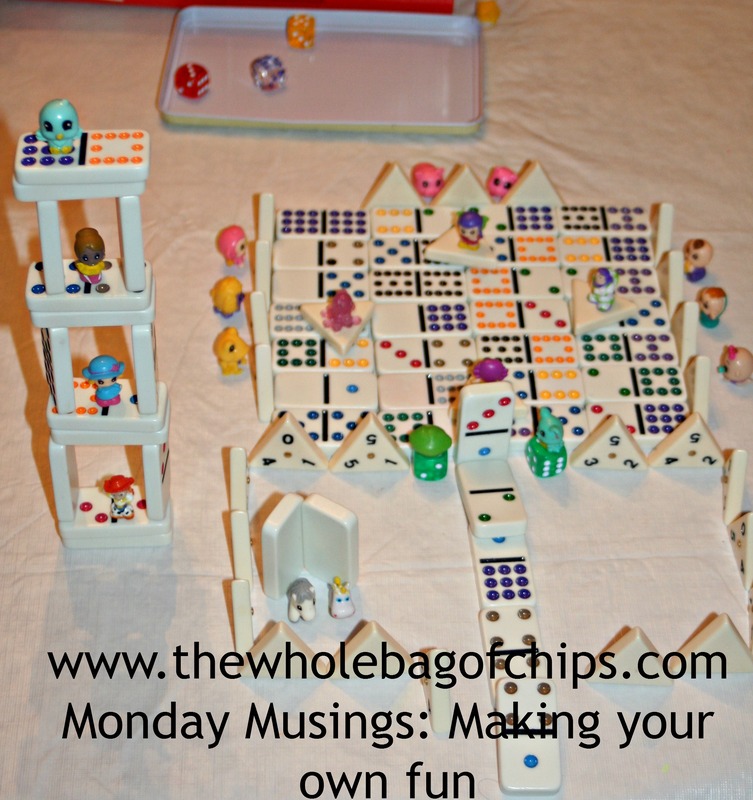 Without any parental direction or involvement whatsoever, the girls created a challenge for themselves, to each take a set of the dominoes and some of the Squinkies, and create their own game and rules for the game, which they’d then teach each other to play. I know I said it, but this bears repeating: this took them several hours. Creating the box for storing their game components was almost as much of a challenge for them as creating the games themselves. Between coming up with the game they wanted to create, coming up with the rules for it, playing it for and with each other, and then the next part: creating a box to store the games in, complete with some marketing images on the boxes, took them hours. The box they created had a challenge to it as well. They decided to use one box, which had originally contained a pair of men’s boots, to store both games. However, they split the box down the middle and each came up with completely unique packaging to market their particular game. I swear to you, I had nothing to do with this. I was downstairs sorting through *last* school year’s papers that I was archiving into bins to save. They were completely engaged, not bored, not arguing, not asking us for ANYTHING, for hours. And best of all, they had a blast. It was a highlight of their week. It didn’t cost us a dime, we didn’t leave the house. They never even changed out of their pajamas. It was excellent. And they were so, so proud of themselves. Sometimes, as parents, I think we get caught up in the pressures of planning the perfect day off, the perfect vacation week, and I think sometimes if we leave some down time in the schedule it can be a good thing. I know that there’s a fine line between leaving too much time free, and leaving no time free, but I think it’s important as we enter this school vacation week, to remember to leave at least some time for the kids to tap into their own creativity and ability to entertain themselves. Nothing pleases me more than to see my kids all playing together, laughing, talking, thinking out loud and being creative. It’s a valuable skill to foster in kids, and who knows what they’ll create! Give it a try this week or on your next snow day, holiday, day off or weekend and see what your kids come up with! They just might surprise you.